With IT directors eking out every scrap of value from their budget in the coming months, we can expect to see a slew of cheap business laptops. Lenovo’s is an ll.6in ultraportable -albeit barely scraping into this category – that prioritizes battery life and power over sleekness. For this is no MacBook Air 11 in. Weighing 1.53kg and measuring 31 mm at the rear, it looks and feels distinctly podgy. 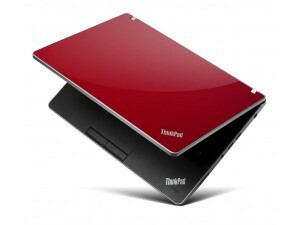 In fact, it’s almost the same chassis as the ThinkPad x100e tech gadgets. The similarities stretch to the D-SUB out and power socket either side of the protruding six-cell battery, and to their battery life: the x100e gave us 6hrs 34mins of light use; the Edge 11 6hrs 32mins. The big difference comes inside, with a low-voltage 1.33GHz Intel Core i3-380UM replacing the lackluster AMD Neo MV-40. And that transforms it. Where the x100e was essentially a netbook rival capable of only basic tasks, the Edge – with its 4GB of RAM -produced a fine 0.89 in our benchmarks. You could just about use the Edge as a main PC, and its corporate credentials are enhanced by a Gigabit Ethernet port. Note, though, that there’s no docking station port: you’ll need to slot a USB docking station into one of the three USB 2 ports. One of those ports is powered too, so you can charge accessories even when the Edge 11 is asleep. Lenovo includes a single 3.5mm jack, so Skype callers wishing to use the webcam should take note that their existing headsets may not work. A little incongruously, there’s an HDMI port to go with the memory card slot for SD, MMC and Memory Stick/Pro media for these tech gadgets. There’s no discrete graphics chip, but Intel’s HD Graphics are enough to ensure 720p videos play without stuttering. They’ll look good too. The display is a cut above that of the x100e, with a glossy finish adding vibrancy to movies. Photos look superb too, and even in everyday work use it’s a pleasure to gaze at. The keyboard feels surprisingly close to the ThinkPads of old, despite the Scrabble-tile design. Purists may not like the reduced key travel, but we reached high typing speeds without any issues: the only compromises are the Page Up and Down squeezed into the cursor key area. Consolation comes in the form of a touchpad and TrackPoint making it easier to use in confined spaces when travelling. The Edge should survive the daily commute as well, with Lenovo’s usual high build quality evident in the sturdy chassis. There is arguably a little too much flexibility in the lid, but we’d be happy to throw this ThinkPad into a rucksack. There’s also an AMD equivalent that uses a 1.3GHz Athlon II Neo K325, integrated Mobility Radeon 4225 graphics and 4GB of RAM. It lasted a similar 6hrs 29mins of light use, but scored 0.67. Factor in the £659 exc VAT early pricing and the fact the AMD version comes with Windows 7 Home Premium rather than Professional here, and we’d stick with Intel for now. Of the two new Intel models, unless 3G is vital the lesser 2GB one looks a bargain. Had that been the unit on review here you’d likely be looking at an award; at close to £400 it’s an attractive budget business choice. Our sample’s appeal is diminished by rising above £500. Still, both tech gadgets deliver performance way beyond netbooks, and give IT managers a cheap, well-made business laptop that’s also a pleasure to use. When a product takes well over a full year to go from introduction to release, it’s natural for consumer expectations to amp themselves up a notch or two tech gadgets. Such is the case with Razer’s Chimaera, an Xbox 360-centric wireless gaming headset that was initially teased at CES 2010, and just started shipping to end users early this year. The company’s been in the gaming headset business for some time now — if you’ll recall, we thoroughly enjoyed our time with the (wired) Carcharias headset right around two years back. This 2.1 system promises to give Xbox Live yappers exactly what they’ve been waiting for, but is it really worth the $129.99 entry fee? Head on past the break for our take. For all intents and purposes, the Chimaera is a pretty simple product. There’s a wireless base station with a 3.5mm audio input jack, a 3.5mm microphone output port, a sync button (not unlike the Wiimote situation you deal with on a daily basis) and a standby button. Upon unboxing ’em, you’ll probably spend the first ten minutes trying to figure out where a pair of rechargeable AAA batteries (included, phew!) are to be inserted. Here’s a tip: rip the panel from the earcup that lacks a microphone. You’ll thank us. The sync process is a lot easier, and while the charging stand is hardly childproof (a simple bump will have your headset tumbling), it serves the purpose without being too unsightly. The headset itself, unfortunately, is both heavy and intimidating. And by that, we mean large. Having ample padding around the top edge and on the ear cups is certainly appreciated, but unless you have a rather sizable noggin, you’ll most likely wonder how on Earth to adjust the band down. 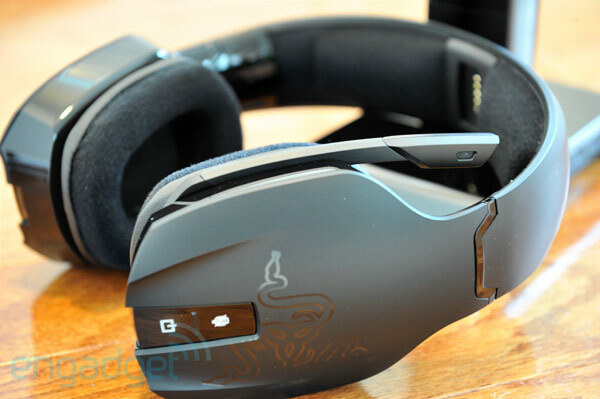 We’ve never had any issues with the sizing on any prior headset tech gadgets, but the Chimaera essentially swallowed our head, and with no way to extend the band tighter (there’s only ten notches of extension — you know, for Goliath’s intense gaming sessions), we were left in an uncomfortable pinch. In all seriousness, we’d recommend stopping by a retail shop and trying these on before buying — it’s hard to imagine them not being too large for a huge swath of people. In an attempt to make the most of it, we kept ’em loosely draped around our skull for a bit of gaming, and while the wireless performance was stellar, we found the 3.5mm headphone input to be (also) a bit on the large side. We tried three different cables, and all of them just felt a wee bit loose. No connection troubles were noticed, but it still managed to get under our skin. Audio quality was above-average for wireless gaming headsets, but these tech gadgets certainly won’t be your go-to cans when it comes time to sink back into a sofa and enjoy an album. The lows were definitely accentuated, likely to enhance explosions often felt in first-person shooters, and we’re guessing that everything’s equalized to best suit movies and games, not music. The fold-down boom mic was perfectly positioned, and our chats soared through loud and clear; we couldn’t help but long for a USB connection option in order to use this as a Skype headset in a pinch, but alas, no such luck. All told, the Chimaera feels like a solid product that wasn’t exactly executed to perfection — the large, bulky design turned us off right away, and the shoddy 3.5mm input didn’t do much to rebuild that lost confidence. At $129.99, you’ve simply too many other options from the likes of Turtle Beach and SteelSeries (just to name a couple), and unless your cranium is larger than most, you’ll probably have no choice but to pass this one by. Are you a true contrarian looking for a camera that befits your nonconformist lifestyle? Well, Canon’s latest entry-level DSLR may not be the most unruly camera out, but at least it sports a moniker that fits the bill. 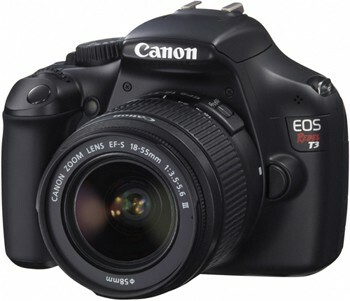 The Canon T3 Rebel, also known as the EOS 1100D electronic gadgets, are a 12.2-megapixel affair designed with the DSLR newbie in mind, and according to a review over at PhotographyBlog, it doesn’t sacrifice image quality for ease of use. 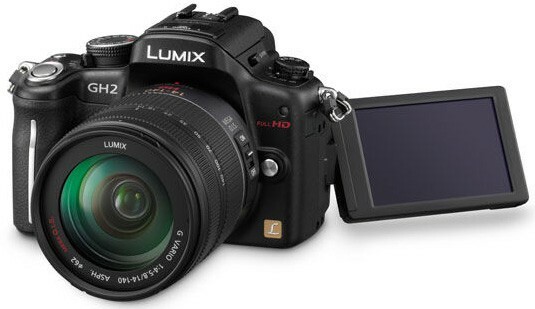 Touted as a successor to the Rebel XS, the T3 actually carries over some useful features from its more sophisticated sibling, the T3i, including a user-friendly control layout, but lacks the camera’s Scene Intelligent auto mode and extensive list of creative filters. Aside from that, the reviewer found T3’s grips too slick and its diminutive LCD screen a minor setback, but was quick to point out that none of these is a deal-breaker. In fact, aside from a bit of noise encountered at the highest ISO setting, the camera delivers high quality photographs even in low light. All things considered, it looks like the Rebel T3 electronic gadgets, is a “responsive and intuitive DSLR” for the novice photog, and at $600, it’s got at least some of the competition beat. Now, we won’t tell you what to do, but if we were you, we’d click the source link to see how the T3 stacks up. Temption is one of my favorite boutique German watch brands, and will release this new version of their CGK collection soon. The CGK205 is the follow up to the tech gadgets of CGK204 (based on the CGK203 – which I reviewed here). The collection houses a decorated Swiss ETA Valjoux 7751 automatic movement (a 7750 with an annual calendar, moon phase, and synced 24 hour hand), and lays out the dial info really nicely. For the CGK205 Temption refines the design a bit and ads a new metal bracelet option. I think it looks stellar. While the CGK205 doesn’t offer a lot new, these are limited production watches from a boutique brand that is hard to get. For me the design is a fantastic mixture between form and function – but not everyone will have the same sense of taste. What I think the watch does well is take the design of the CGK203 and mix it with the CGK204 is a more conservative and classic manner. For me this watch is more exciting than the CGK204 because it updates the design but includes what I loved about the CGK203. The steel watch and bracelet are 43mm wide, while the bracelet now uses horizontal style links (though a middle link is hidden on the inside for greater wearing comfort). Really nice with that typical German boutique watch makers attention to detail and quality. Price is $3,670. Contact Temption to ask where to get one (or direct from them). Last I heard most of what they produce is sold in Asia (often Japan). Movement T18.1 based on Valjoux 7751 with fine adjustment and incabloc, 25 jewels, 28800 semi amplitudes/h, power reserve min. 42h, finish: Rotor circular stripes, engraved, bridges pearled, blued screws. FastMac’s U-Socket may have veered perilously closer to vaporware territory after what seemed like an endless series of delays, but it finally started shipping out back in January to those patient enough to hang onto their pre-order, and we recently got our hands on one to see if it was really worth the wait. The short of it is that it does indeed work as promised once you get it installed, although that process may not be quite as painless as you’re expecting. Read on for our full review for these coolest gadgets. Contrary to outward appearances, the complete unit is actually quite a bit bigger than a standard power outlet, and it requires at least a 16-cubic-inch electrical box to accommodate it. That meant we had to swap out our smaller electrical box for a larger one, which may or may not be an easy thing for you to do (it wasn’t for us). Once in place, however, the U-Socket looks unassuming and gets the job done. The two USB 3.0-compliant ports have 12W of total charging power and are rated at 2.4A, which means it will charge a single power-hungry device like an iPad at full speed just fine, but slow things down if you plug two in at the same time (two lower power devices will charge just fine at the same time). You can also obviously have things plugged into the two power outlets while your USB devices are charging. Those concerned about potential extra charges on their power bills also don’t have anything to worry about, as the U-Socket is designed to cut off power to the USB ports when nothing is plugged into them — something FastMac says will actually save you up to $25 a year in reduced energy costs, though that’s admittedly tough to verify. Of course, there are a few inherent downsides to a USB port-equipped power outlet, the most obvious being a lack of flexibility. Unless you’re actually installing a new outlet, you’ll likely be using it to replace one of your current outlets, which might not be in the most convenient location for charging your various devices. At $22.95, it’s also one of the most expensive power outlets you’re likely to find, and makes installing a bunch of them throughout your house quite a pricey proposition. One other more minor drawback is that you obviously can’t just go to the hardware store and buy a replacement faceplate if you happen to break yours. FastMac will sell you a replacement for $2.99, though, and it’s even promising various colors and styles including wood and metal. A separate, more stylish “Decora” model is also now available to order for $25.95. Unfortunately, while the U-Socket is now actually shipping, it’s still not quite as readily available as we’d like. FastMac says it is “still catching up to the demand,” and it’s now listing a four to six week delay for orders on its website. The company cites its rigorous testing procedure as a partial reason for the delays, and says that it’s trying to ramp up production while still maintaining strict quality control. Despite those few drawbacks, however, the U-Socket is unquestionably unique coolest tech gadgets, and an idea whose time has certainly come. 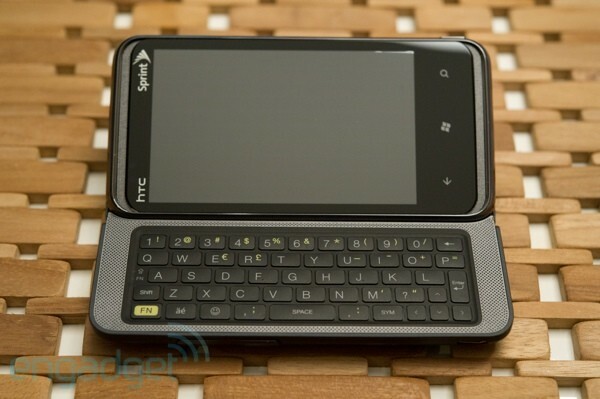 We just hope that the both the size of the price tag and the device itself shrink a bit as it becomes more common.